Cass M&A and PE Society is proud to host Justin Thomas from AMT Training for the 3rd in the series of AMT’s Modeling Training. Normally offered to Experienced Finance Professionals, completing this training will help you improve your competitive advantage in your future careers, all at a greatly discounted rate only for Cass students. 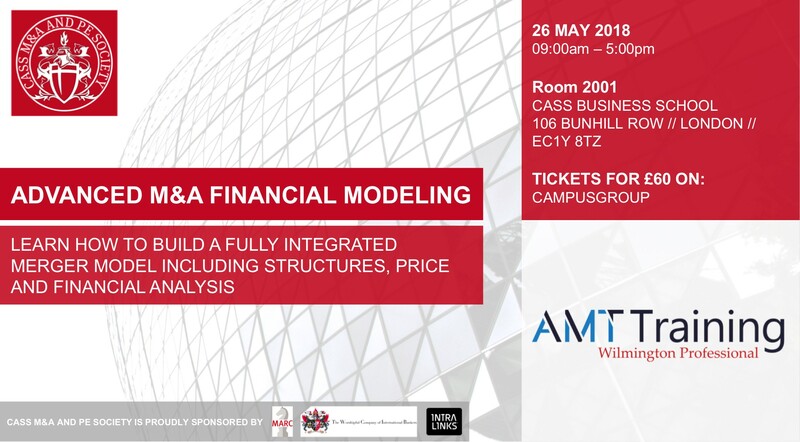 The Advanced M&A Modeling day teaches delegates how to build a fully integrated merger model which combines financial statement forecasts for the acquirer and the target. Practical consolidation issues are also addressed. Deal analysis focuses on the financing structure, pricing, earnings and credit impact and value creation.